Madden NFL 18 remains a solid game and while it opens up some exciting possibilities for future iterations, it doesn’t differ significantly from Madden 17. The NFL season starts not with the opening night kickoff but with the release of the latest Madden game. Though the franchise often takes flack for being literally the only game in town, the work the folks at EA sports have done over the years is often criminally underrated by gamers. While we believe EA would benefit from some competition, Madden is still an excellently made game each and every year. It’s solid, fun and reliable. Madden 18 is no exception. Madden NFL 18 is the best looking Madden game to date. The new Frostbite engine adds a ton of detail making the players and stadiums look as realistic as ever. The engine really gets to shine in the new Longshot story mode (more on that later) and it may be that the team at EA is just scratching the surface of what they can do with it. There were certain moments, especially during Longshot, where we forgot we were playing a video game. For us, this year’s game clearly was all about Longshot. The new story mode follows the story of Devin Wade (played by J.R. Lemon), a former high school star QB who quit his college team (Texas Longhorns) early in his first year. Wade, along with his best friend Colt Cruise (played by Scott Porter of Friday Night Lights fame) are heading to the NFL Regional Combine with hopes of being drafted. Wade, who barely played a down of college ball, and Cruise, who is undersized and not particularly fast, are your classic underdog longshots. Longshot is essentially a movie with a tiny bit of gameplay and decision-making sprinkled in. It’s much more like Telltale’s Game of Thrones than, say, NBA 2K‘s MyPLAYER mode — though there’s some gameplay, it isn’t particularly compelling. The production here is top quality. The story looks absolutely gorgeous, the music is great and the acting ranges from very good to excellent. As mentioned above, at times you’ll forget you aren’t watching a film. The problem with Longshot is that it just didn’t aim high enough with the script. The story and direction is riddled with cliches. The underdog QB trying to make a comeback. The joker best friend with the heart of gold. The crusty mentor. The sleazy TV exec. There are copious amounts of sunbeams streaming through trees. There are pickup trucks. And of course, there is Texas, because where else would a football story be set? The characters are all winning enough, despite being primarily archetypes. 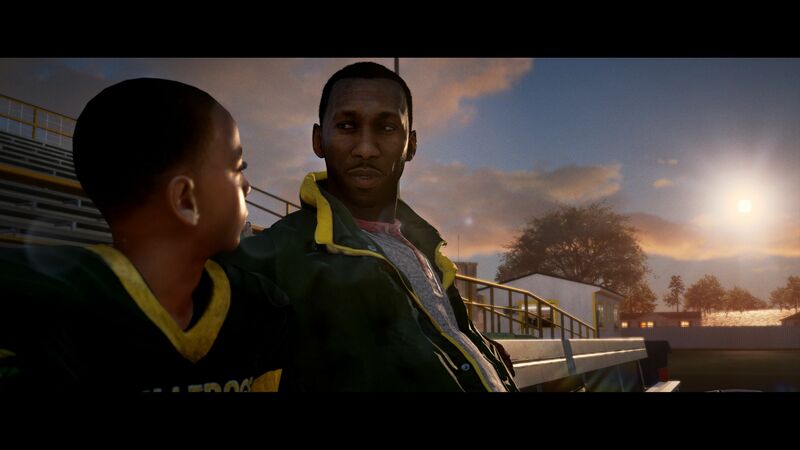 It’s super cool that EA managed to get Mahershala Ali to play Devin’s father but the Oscar-winning actor is criminally underused. Aside from the opening scene and some repetitive cut-scenes during games, he’s hardly in the story at all. An actor of his stature wasn’t cheap but his character should have been better utilized. It isn’t all bad. There are some surprises and we did enjoy the idea of the Devin’s character taking part in a reality show. Devin’s internal struggles and lack of confidence were certainly interesting but they would have been more so with a less cliche plot. In the end, the decisions you make will impact both Devon and Colt’s draft stock. We played through the rather lengthy mode twice and both times gained the same result of Devin being drafted late in the seventh round and Colt not being drafted at all. An EA spokesperson told us there are three different outcomes, including Devin being drafted, Colt being drafted or both of them being drafted. The problem here is that the mode takes a few hours to complete and there’s no way to play it chapter by chapter. Though different outcomes are possible, the mode doesn’t offer much replay ability. The story doesn’t seem to change too much based on your decisions and so our second trip through the mode was rather tedious, since the player must wait through a fair amount of story between decision-making and gameplay. All that aside, the mode certainly has a ton of promise. We’d love to see a new story each year with improved gameplay, more direction and clarity in the decision-making process and a way to skip around the longer cutscenes you’ve already seen. As a first pass, Longshot is perfectly adequate and fun to play through once. If EA can build on this maiden voyage, the story mode could offer loads of interesting possibilities in the future. Ultimate Team is back and this year with all new “MUT Squads” which allows players to jump into 3-on-3 contests. Players can choose from three different roles, including Offensive Captain, Head Coach or Defensive Captain. The Offensive Captain and Defensive Captain will bring their respective playbooks and players into the lineup with the OC being able to control the QB at the start of each play. Each Captain can also control their respective audibles. The Head Coach brings their stadium and uniform, controls timeouts and can play as any offensive or defensive player not controlled by a human teammate. As far as new gameplay features, there isn’t a whole lot of new stuff here. Franchise is pretty much exactly the same as last year. The few tweaks that have been added don’t bring a lot to the table. Targeted passing allows you to lead your receiver to specific spots on the field. It’s a big part of some of the sequences in Longshot and can be used in regular gameplay. It involves dragging a target to a spot on the field after the ball is snapped. Frankly, targeted passing is the worst Madden gimmick since the QB vision cone. It is pretty much impossible to use. You only have a couple of seconds to drag the target where you want the ball to go and it’s very difficult to time things up with your receiver. If you do it fast enough, the receiver will break off his route to your selected spot but if you don’t place the target in just the right spot at just the right moment, you’re looking at a big, fat incompletion or worse. We’re sure some folks will get the hang of it and use it to its desired effect but we found it frustrating. The game also offers “new” modes like “arcade,” “simulation,” and “competitive” but these don’t feel much different than playing the old difficulty levels. The overall gameplay feels a lot like last year’s version of the game. There are some new playbooks which breathe a bit of fresh air into the experience. What stood out to us the most were improvements to the running game. In Madden NFL 17, we couldn’t run the ball to save our lives. We’ve always felt the running game was either too hard or too easy in Madden but this year the team at EA seem to have found a sweet spot. Last year, it seemed to take until the fourth quarter for the running game to open up but this year there’s a much better balance. We found ourselves breaking through for some decent gains only to be stonewalled for a few plays. This made for a much more realistic experience. The passing game seems roughly the same. We did encounter a few buggy moments, like receivers running into each other or interfering in another receiver’s route but for the most part the gameplay was smooth. It is still way too easy to complete corner routes but the overall experience is still feels authentic. Madden NFL 18 is basically Madden NFL 17 with updated rosters, a more robust Ultimate Team experience and a cool, if somewhat underwhelming new story mode. There are obvious challenges in turning out a new game every year but Madden NFL 18 feels more like a half step on the journey to something better rather than a great leap forward. Frostbite and some improved gameplay are a nice step up from last year’s game. While we can’t rave about this year’s title, it’s still Madden and it’s still loads of fun. Walk, don’t run, to buy Madden NFL 18 and hope EA takes what it has learned this year and delivers a true jaw-dropper with Madden NFL 19.